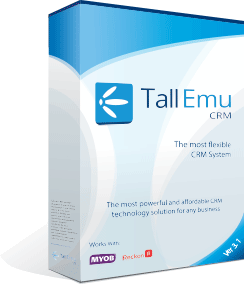 Tall Emu CRM is a big, powerful system that can transform how you work – but you need to know how to use and modify it to work with you. You can’t effectively learn it by yourself. There are many ways of doing the same thing in a CRM. We can help you select the best way. We can help you understand the short cuts, the automation possibilities and how to work faster with less data entry. CRM, with our help, can remove inefficient ways of working and get ahead of your competitors. Without help, you may be destroying your investment in CRM, have unhappy staff with people reverting to paper based processes and lose productivity. We have an ad-hoc support rate but this can become expensive, having to pay every time you need help and it can be a dis-incentive to get help when you need it. We discount our managed support fees so that you commit to a long-term education of using the CRM and getting better value out of it. With Managed Support you can actually save money, but the primary reason you get Managed Support is getting more out of the system and work smarter. *unlike Ad-hoc rates, companies on MS will be billed by the minute not increments of 30 minutes. If you elect to pay your Managed Support annually, you can claim a 10% discount on the managed support fees and a further reduced rates for the Additional hours. M4A – $270 per month, includes 4 hours (effective rate $67.5). Additional hours billed at $175+GST. M8A – $540 per month, includes 8 hours (effective rate $67.5). Additional hours billed at $170+GST. M16A – $1,080 per month, includes 16 hours (effective rate $67.5). Additional hours billed at $160+GST. Any changes involving programming costs $190 p/h. We have at least one big sale a year. If we offer a 30% discount you’d get 36% discount. We usually make 3 releases a year. Learning to use the CRM properly is smart. Do I need CRM Managed Support ?